Picking the right income stocks isn't easy, but this simple checklist can stop you from buying the wrong ones. In today's low-interest rate environment, millions of investors are turning to dividend-paying stocks to help them generate income. That can be a savvy strategy -- if you have a system in place that separates the best of them from those that are destined to be duds. With that in mind, here's the checklist that I use to help me narrow my options down to the best dividend stocks. I'm convinced that the first step to picking great income stocks is to eliminate any company from consideration that is not in control of its own destiny. Companies like this often produce commodity products or are highly dependent on a strong economy to help them earn a profit. This criterion naturally eliminates several industries from contention. After all, while the demand for healthcare or consumer staples remains strong even when the economy sputters, you can't say the same about iron ore or luxury handbags. 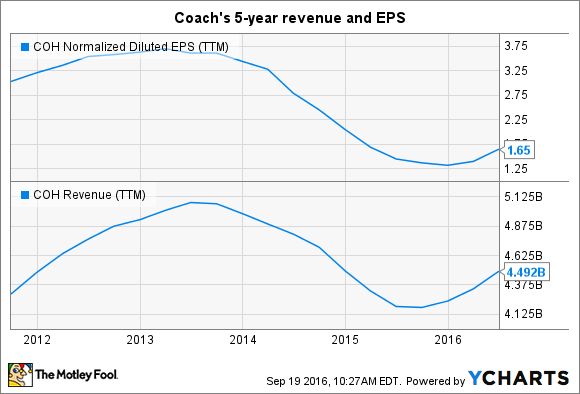 That's why I think a company like Coach (NYSE:TPR) should be immediately excluded from your shopping list. Sure, it can put up fantastic profit growth when its products are in style, but when consumers' tastes change, the company's financial statements can really take a hit. That makes it hard to predict the company's long-term results, so even though this stock yields 3.8%, I for one plan on staying away. The best dividend-paying companies often have long histories of not only paying dividends, but increasing their payouts every year. It's hard to do that for years on end without growing revenue and profits too, so I think that investors should exclude no-growth companies from their shopping list. As an example, consider pharma giant AstraZeneca PLC (NYSE:AZN). The company's products remain in demand no matter what's going on in the economy, and its current dividend yield is 2.6%. Sounds like a winning income investment idea, right? I for one don't think so. AstraZeneca is dealing with the very recent loss of patent protection for its best-selling cholesterol drug, Crestor, which in Q2 still accounted for about 17% of total sales. Management is going to have a tough time filling that hole as generics rush in, which is why analysts are projecting profits to decline by 1% annually over the next five years. That's going to make it hard for the company to grow its payout, which makes me think this is a stock to avoid. The payout ratio is, simply, the percentage of a company's earnings that it uses to pay dividends. As an example, if a company's annual earnings are $2 per share, and it pays out $1 as a dividend, then its payout ratio is 50% ($1/$2). In general, a lower payout ratio indicates a more sustainable dividend, as it means there's more wiggle room in the company's financials. Even if earnings fall, they have a cushion before dividends start cutting into the operating budget, or require new debt to sustain. On the flip-side, a high payout ratio hints that a company is skating on thin ice, which to me is a big red flag. Consider the cigarette maker Vector Group (NYSE:VGR) as an example. The company's products stay in demand through all economic cycles, and analysts are even predicting low single-digit earnings growth over the next five years. Those factors make the company's dividend yield of 7.3% look quite tempting. However, Vector Group is only expected to produce earnings of $0.71 per share this year, which is less than half of the $1.60 per share that it pays out in annual dividends. That gives it a full year payout ratio of 225%, which is unsustainable over the long-term. Measuring dividend stocks against the criteria above will go a long way toward weeding out the duds from the companies you want to add to your portfolio. I recently did just that with a group of stocks that I was interested in buying, and one company that passed with flying colors was CVS Health (NYSE:CVS). In addition to owning one of the largest retail pharmacy chains in the U.S., it also operates the second-largest pharmacy benefits management business in the country. Demand for both of these services tends to remain high throughout all economic conditions, which makes its financials resistant to downturns. In addition, given the gradual graying of the American population, CVS Health is well positioned for long-term growth. Finally, it has a long history of paying out dividends, and its current payout ratio is a very sustainable 31%. With a current yield of 1.9% and a bright future ahead, I think CVS Health is stock that income focused investors can learn to love.